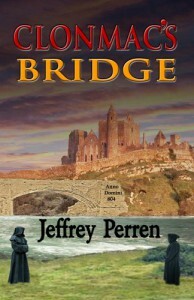 An exciting adventure full of mystery, danger and history, Clonmac's Bridge takes us to several areas of the world, as an archaeologist fights to uncover the truth. I loved connecting with these characters, while experiencing their enthusiasm and passion for history. With the feisty and independent Mari, and the quirky, passionate Griffon, this story comes to life, and captures you completely. Their swirling relationship was sweet, and I loved the changes Mari went through, as she found a new level of independence from her past and her father. Jeffrey Perren is a very talented author, easily taking his readers on grand adventures, while teaching them something along the way. This book is a wonderful example of his skills as a storyteller, writer, and history enthusiast. I would recommend this book to any fan of historical novels - if you think it sounds interesting, then I'm sure you'll enjoy it. I plan on reading it again, several times, and look forward to future books from Mr. Perren.